Hurricane Sandy Effected The Entire Tri-state Area Around New York City, Leaving Millions Without Power And Displaced From Their Homes. The Storm, Which Touched Down Around Halloween, Is Still At The Forefront Of Our Minds. Pop Stars Did Their Part And Performed At The Largely Classic Rock-leaning 12-12-12 Concert Event That Took Place At New York City’s Madison Square Garden On Dec. 12. 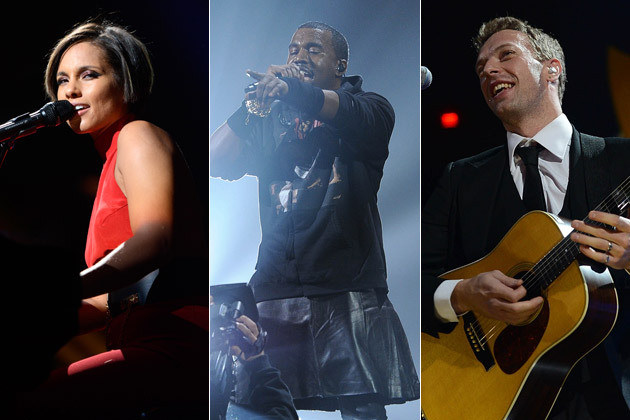 Kanye West And Alicia Keys Were On Hand To Lend Their Talents For Good, As Was Coldplay Frontman Chris Martin. Keys Was The First Artist Who Performed At Around 10 Pm. Looking Lovely In A Red Jumpsuit With A Halter Top And Her Angled Bob, Which Is Growing Out Beautifully And Now Boasts A Blonde Streak, Began Her Set Performing ‘brand New Me’ While Seated At The Piano. West Took The Stage Around 11:15 Pm, As The Only Rap Act Of The Night. He Kicked Off With ‘clique’ And He Wore A Hoodie And A Black Leather… Kilt. He Paired His Skirt – Well, Kilt, If You Prefer — With Pair Of Leather Pants While He Popped Off Hits. Did He Raid Girlfriend Kim Kardashian’s Kloset Before The Event? The Camera Didn’t Pan To The Crowd Much, Since It’s Likely Not West’s Demographic. However, Keys And West Certainly Represented The Pop And R&b Genres Well.